This makes a lot of pasta salad. Enough that we're still eating it tonight. Leftovers thrill my husband ever so much. I am SO glad you posted this. I saw your Instagram and KNEW that had to be hearts of palm in there and I love that stuff. I could eat it right out of the can plain- and finish it off. Lovely looking salad. This is a pinterest-able recipe for sure. I think I shall pin it. Also- I am glad your mom & boys are ok. I was so excited to see the salad I didn’t even read the whole post. Whoops! 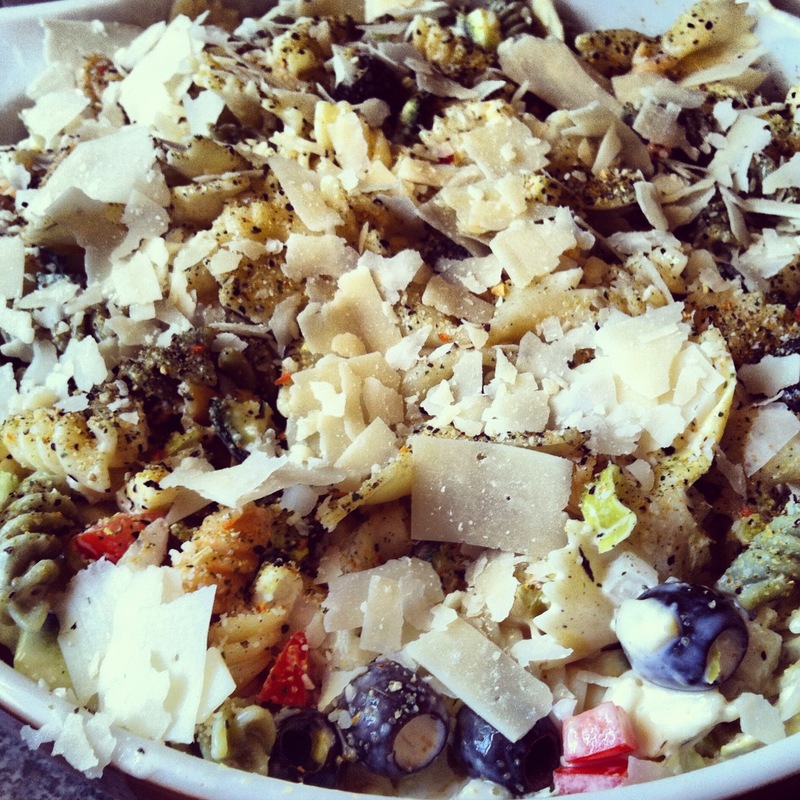 I LOVE LOVE LOVE pasta salad. In fact, I may marry yours. Yeah, you know…it’s great and all but I don’t think your children would be nearly as attractive as the one’s you’ve got now. In an effort to still feed my family I crank the AC colder before making dinner and give preference to the oven and crockpot versus standing over a hot stove. I must need to practice my glare. The gas stove takes FOREVER to boil water. Never would I have thought I might prefer electric over gas. I normally love cooking with gas, but boiling water is that absolute worst with it. It’s hotter than two squirrels screwing in a wool sock. ** HAaaaa. So. Hot. I just made hot tea to get a caffeine fix and am sweating looking at the mug. I love pasta salad, and I love kitchen sink anything. I often make kitchen sink Mexican dishes because it’s hardest to screw up Mexican if you use enough hot sauce. 😉 Happy Sunday! this looks fantastic. I make something not nearly as wonderful, so I will revise to your method. I add really good tuna as well. Your mom’s pasta salad was really, really good. But I don’t blame you for not asking her. Boiled mayonnaise. YUM-O. Ahem. This also looks really, really good. It contains about fifteen ingredients that I’ve never bought (that might be a tiny exaggeration), but still. YUM (for real). Also, yay for cooling down a little today!! You are so funny! Did you think of those ‘Hot’ statements by yourself? So clever. I really enjoy your blog. Glad Mom is doing okay. What about the boys? It’s hot here this week. I’m thinking about skipping eating and going straight to drinking. Is it wrong that I really want to catch two squirrels and make them screw in a wool sock right now? Oh wait no. 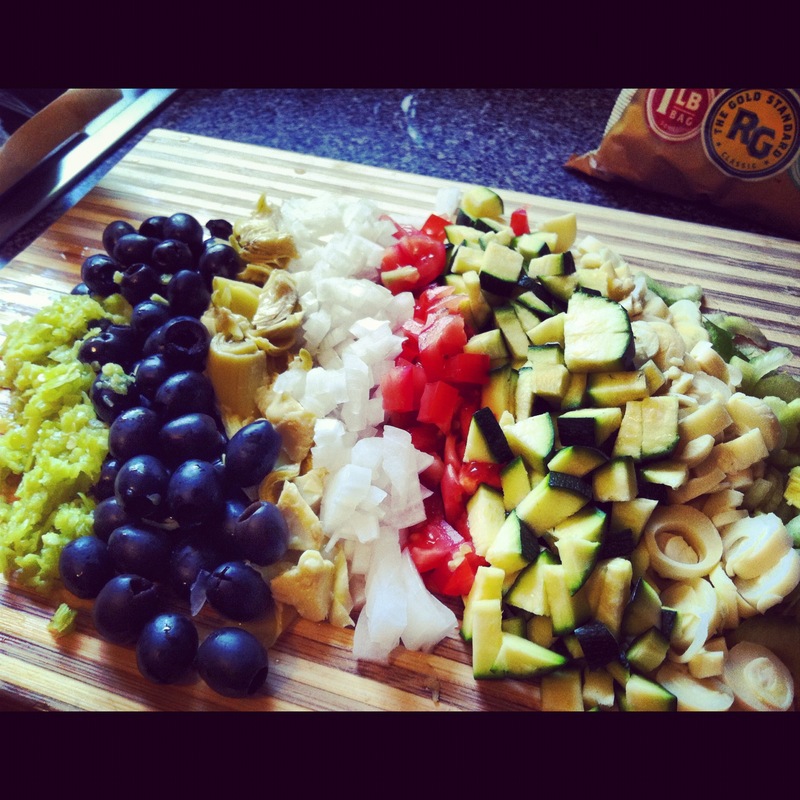 I want to make that pasta salad. That’s what I really meant. You make kitchen sinks look good. But on a serious note, I’ve been out of touch with the blog world so I’m sorry to hear about your mom’s crash. How scary and awful and painful. Still, I’m relieved to have come in on the story after I know that everyone is (relatively speaking) safe. Except maybe for any squirrels who live around these parts.